Sometimes we become creatures of habit. We have our favorite bikes, restaurants, and ride routes. Often, our favorites become traditions. One of my favorite definitions of a tradition goes something like this: Traditions are a group effort to keep the unexpected from happening. In case you missed it, Sound Rider this month published the five hidden gems for motorcycle rides in Oregon. 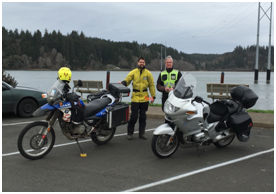 Here is the link: http://www.soundrider.com/current/1602/oregon_paved_bucket_list.aspx Sound Rider assured us that these were definitely “bucket list” worthy. 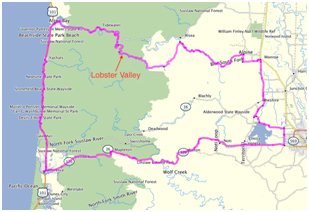 This turned out to be true, Lobster Valley Road was on their list, and right here in our backyard as an extension of Alsea Falls Road. That brings me back to tradition. I have a rule. Here it is. Always, pre-ride the route before a group ride. I broke this tradition. Luckily I got away with it, all-be-it with some very heads-up riding. It was fare - fare. Coffee Roasters in Florence. Although roads were quite good one had to be especially cautious of those Spring-time hazards: gravel washed over the road surface, ever present moss, wet leaves, pot holes and oil sheens. We encountered them all on this ride. Head and eyes up folks – watch for changes in road surface color and texture and assume reduced traction ahead. We all convened at EMCWOR in Eugene for a 10 a.m. start. 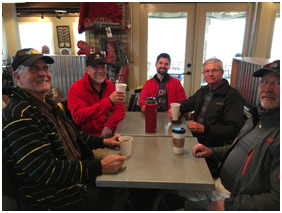 Butch Ferrand and Bob Whitlock had ridden in earlier from Florence to join us and spend cash on new tires for their upcoming dual-sport summer adventure. The other usual suspects to show were, of course myself, and Doug Tewksbury. 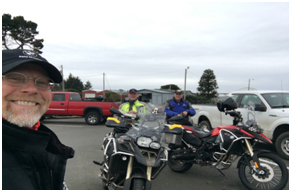 Jeremy Brosnahan, a prospective BMWRO member, also joined in the ride.